There is no doubt that the eyes give an indication of how you are feeling and the state of your health. The eyes are quick enough to show signs of neglect, since they are particularly exposed to dirt, dust pollution and smoky atmosphere. 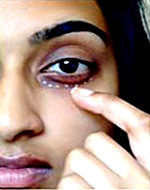 Dark circles occur under the eye due to a combination of reasons. It is noticeable under the eye, as people get older. As we age and receive more sun damage to our facial skin, the thin skin under the eye can become thinner and wrinkled, which allows the veins in the fat pad under the eye to become more prominent. As the skin here is slightly darker than the rest of your face, any changes in health show up immediately in this delicate area. Some people think that they occur because they are either tired, or as a result of sun exposure. However, this may not be the case also. Sometimes the dark spots can be hormonal, but often they are just hereditary. 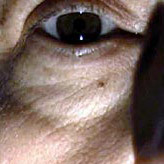 Sometimes the dark spots are caused by the reflections or shadows cast by the bulges of fat that occur naturally in the lower eyelids as people get older. If the bulging of fat is the cause of the dark circles under the eyes, then cosmetic surgery to remove the fat bags is the only approach that is typically effective, other than concealer makeup. There are many contributing factors that make dark circles around the eyes more noticeable. - The skin covering the eyelids thins out as a person ages and starts to loose its elasticity. With the skin being thinner, the blood vessels underneath become more apparent. To assist in collagen formation and re-vitalizing your fragile skin around the eyes - please consider taking an extra vitamin C (ascorbic acid) supplement, after checking with your medical practitioner. - Tendencies such as allergies or thinner eyelids pass on from generation to generation. - Although allergies are often the blame for dark circles, anything that causes chronic nasal obstruction can be the culprit. You might not have a major medical reaction to an allergen, such as wheezing, couching, sneezing or a closed chest - you could simple have a slightly stuffy nose, or swollen eyes most of the times. Tests can be done to determine environmental or food allergies with a simple skin scratch test, a blood test or other alternative types of testing. If you have any of the tests done, and they come up positive for any item that you could avoid as far as possible, go the extra mile and try to cut the allergen out of your sphere of living - be that either environmental or food in origin. Vitamin C is effective in fighting allergies. - Plain tiredness will also add to the problem of bags under your eyes, and especially to those ugly dark circles under the eyes. Have a look at the amount of hours you sleep and also check on the amount of hours you work in front of your computer or watch television - both these actions place a tremendous strain on your eyes. - You might not smoke yourself, but even secondary smoke can affect the way your eyes look. Most people will have a violent reaction to smoke, such as the eyes turning bloodshot or watery, while others will manifest their allergy as swollen eyes. Take vitamin C as smoking kills off large amount of this vitamin, every time you light up. - Try and cut down on eating raw salt as it could add to your problem with water retention. - Fluid retention can be a major cause of swollen eyes. Vitamin C is a natural diuretic and an increase in this vitamin will not only assists in removing excess water from your body, but will also assist with collagen formation. - menstruation, pregnancy, thyroid and over exposure to the sun. The following are some tips and a few exercises that will help alleviate or conceal the dark circles. Dip a cotton swab into freshly extracted mint juice, rosewater or cold milk. Lie down with your feet raised higher than your head, and then place the wet pads on your closed eyes. Stay that way for 10 minutes. Gently massage saffron or almond oil on the dark area before going to bed. Lie down and place a slice of cucumber or potato on each eyelid for about fifteen minutes. Follow a diet rich in iron, vitamins and proteins. Deficiencies immediately show up as circles under the eyes. You can also use a mixture of almond oil or cucumber juice with lemon juice to lighten dark circles. Drink lots of water and get plenty of rest. 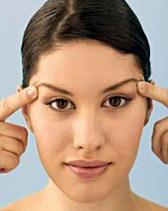 This exercise is known as the palming or cupping of the eyes. This requires for you to put the base of your palm over closed eyes and press gently. Then cover the eyes with cupped palms. Open the eyes and look in to darkness created by your palms. This will relax your tired eyes. Begin by opening and shutting your eyes tightly. Do this ten times, twice a day. Focus on a pencil or object held close (about 10 cm) to your face, the fix your eyes on a distant object, then look at the pencil again-do this five times. With the head erect, move your eyes, by first looking at the roof and then the floor. Repeat 10 times. Again, look first to the extreme left and then extreme right. Remember that healthy, bright, sparkling eyes look beautiful, since they are clear. Sit down and relax. Breathe normally, and look at a spot between your eyes, above the bridge of your nose. You should keep looking at this spot for a count of five and then relax the eyes. Next look at the tip of your nose, also to the count of five and relax. This exercise will ease the stress and tension and will relax your eyes. Sit down and relax and look straight in front of you. Inhale and look right as far as possible, without turning your head. Slowly come to the original position and exhale. Repeat the same method for the left side. Do this exercise three times. Sit up straight and look down. Slowly inhale and start rolling your eyes to the right and then to the top, in a circular movement. When your eyes have reached the top, looking towards your eyebrows, start exhaling while moving your eyes left and downwards in a circular movement. Repeat three times. Beautiful eyes are the very essence of youth and beauty. But as time goes by, stress, lack of sleep and many other factors contribute to the puffiness of eyes, which can lessen its beauty. Puffiness under eyes is basically caused due to fluid and fat. Puffiness results when a fat pad that cushions the eye begins to pull away from the bone of the lower eye and sags due to age. Heredity makes this more of a problem for some people. Retaining water can also cause puffiness, especially in the morning. Thus if you see puffiness under your eyes, that is an indication that you`re probably not getting enough water in your system and thus drink plenty of water. When a person is dehydrated the body starts storing water as a defense system and this will add to the puffiness around the eyes. Also, under eye puffiness can indicate that you`re sleeping on a pillow that is too flat, ingesting too much salt or perhaps celebrating with alcohol to a greater degree than normal. Excess salt intake, kidney or heart problems, steroid use and other conditions that cause water retention can create puffiness under eyes. For this disorder, caused by fat, cosmetic surgery is recommended to remove the fat pad. Making a minimal incision inside the lower eyelid, surgeons are able to remove the sagging fat pad that causes puffiness. Laser treatment to vaporize extra skin around the eyelid can also make a difference. The puffiness of the eyes can be reduced with a glass of ice water and four stainless steel spoons. Chill the spoons in the water and then place one over each eye. When the spoons become warm, switch them with the others chilling in the glass of water. Keep switching until you see improvement. Settle down for two to five minutes with a chilled, steeped chamomile or green tea bag over each eye. The natural properties of these herbal teas help to bring puffy eyes back down to size. Cucumber contains anti-inflammatory properties to reduce redness and puffiness of eyes. Slice a large cucumber reserve two slices to place over eyes. Peel and puree the remaining cucumber. This can be applied as a pack onto your face. Remove after fifteen minutes. Apply moisturizer thickly to seal in water. A natural and effective treatment is to use vitamin E oil and rub the oil overnight around your eyes. Strain the juice of grated potato and saturate cotton wool pads with it or lay the grated vegetable on the eye between the muslin. Slices of raw potato will soothe swollen eyelids and reduce swelling and puffiness. A drop of perfectly fresh castor oil smeared along the eyelids will also remove puffiness. A few egg whites stiffly beaten and applied with a brush to the face and under the eye will make the skin feel tighter and look less puffy. Rinse your face in cold water when you wake up or when puffy eye attacks you anytime of the day to constrict blood vessels and reduce swelling. Avoid foods high in saturated fat and consume more fibre in your diet. Regularity helps move toxins out of the body, which helps control puffiness. Get enough sleep. If you don`t, the skin surrounding your eyes is guaranteed to swell. You must get 8 hours sleep daily. Sleep on your back with your head elevated by two pillows. This allows fluid to drain overnight instead of collecting under your eyes, causing puffiness. A number of herbs can help for soothing, toning and brightening eyes. Eyebright is a particularly helpful herb for various eye troubles and makes and effective eye compress. Make an infusion using 1 tablespoon of chopped Eyebright and 150 ml (1/4 pint) of boiling water. Leave until cold, strain into a screw-top bottle and use within 12 hours. To make a compress, soak two cotton wool pads in the cold Eyebright infusion, squeeze slightly and place one over each eyelid. Rest for 10 minutes, however, an ideal time would be while lying in the bath and replacing the cotton wool once it becomes warm. Finally, dab the eyes with fresh cold water and pat dry with a soft clean towel. An infusion of elder flower/elderberry, made in the same way is a mild stimulant and can be used in a compress for brightening the eyes. An infusion of chamomile flowers makes a soothing compress and reduces inflammation. Chamomile or rosehip teabags available from health stores can be used for puffiness and dark circles under the eyes. Steep two teabags for three minutes in boiling water then remove and set aside. When they are sufficiently cooled place one over each eye. Leave for 10 minutes and sip the tea while resting. Another remedy for puffy eyes is to apply the grated flesh of an unpeeled potato to closed eyelids for about 20 minutes. Cucumber juice applied to the area below your eyes every night at bedtime may help if you have dark circles.